Skopelos is seen by many as being the most beautiful of all the Sporades islands, as well as one of the most picturesque in all of Greece. The landscape you will find here is a magical combination of mountain and sea, where the colours of blue and green blend together perfectly as though the island was a watercolour painting. Skopelos is a holiday destination that attracts huge numbers each year. Out of the three main islands of the Sporades, Skopelos is the largest, and is situated between Skiathos and Alonissos. It is a popular location and island hopping between the Sporades is very popular with visitors, allowing them the chance to experience each individual island. You will find some amazing beaches around the island that idea for swimming and relaxing during the hot summer season. There are some beaches that also offer a range of water sports that you can enjoy if you desire. Being an island of immense natural beauty, Skopelos is ideal for those who enjoy outdoor activities such as trekking, biking and various others. It is an island that needs to be explored to be fully appreciated, and taking a walk around the various paths will help you discover just how special and beautiful Skopelos really is. The island has a large number of interesting churches and monasteries that one can visit. Inside you will find lovely collections of religous art, icons and artifacts. 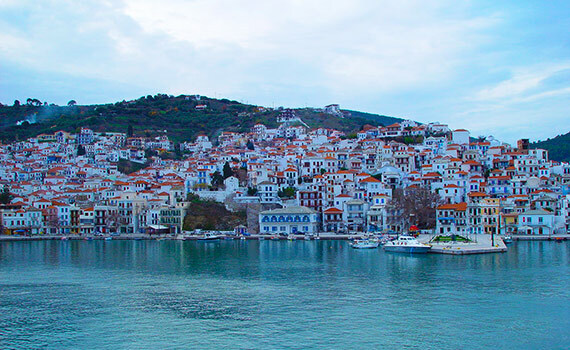 No matter what type of holiday are searching for, Skopelos is the perfect choice, and will have something for everyone. We offer a number of sailing holidays as well as daily tours that visit Skopelos, allowing you the chance to experience for youself this truly unique and beautiful Greek island.